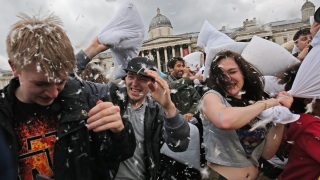 Londoners take part in a giant pillow fight in Trafalgar Square on 'International Pillow Fight Day' on April 4, 2015 in London, England. International Pillow Fight Day: It totally exists, and of course D.C. is celebrating Saturday on the Mall with... a pillow fight! Fluff your pillows and show up on the National Mall, on the northwest corner of Independence Avenue and 14th Street this Saturday afternoon for the battle. The event is organized by Capitol Improv -- the same people that brought you the No Pants Subway Ride. Of course. The organizers do have a few ground rules: Try not to bust your pillow and make a mess. Don't knock down small children when showing off your pillow-wielding prowess. And hide your glasses! The signal will go off around 3 p.m. and then you can start swinging. The organizers said this is the eighth annual pillow fight and they expect thousands of people to show up. Expect an exceptionally busy Saturday in downtown D.C.: Between the cherry blossoms, the Blossom Kite Festival and a marijuana legalization protest featuring a 51.5 foot joint, the Metro may get crowded. You can find more information about the pillow fight on the event's Facebook page.